Lionel Messi and Cristiano Ronaldo were at their brilliant best in the 21st round of Liga matches at the weekend, as Barcelona and Real Madrid both romped to four-goal victories on Sunday, three days ahead of the season’s fourth Clasico clash. Barca and Blancos meet in the Copa del Rey on Wednesday but made light work of their league matches with wins over Osasuna and Getafe, respectively, while Athletic Bilbao returned to form with an impressive 3-0 victory at home to second-placed Atletico Madrid. 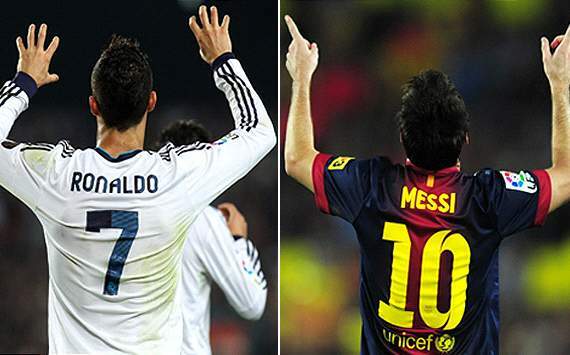 Here, Goal.com looks at the standout performers in the latest round of Primera Division games. In goal, Gorka Iraizoz was key in Athletic’s win, making a number of key saves to thwart Atletico. At the back, Vladim Demidov led Celta Vigo to a creditable draw against Real Sociedad, even though the Galicians played with 10 men for 40 minutes. Sergio Ramos returned from his suspension in style with a goal and a clean sheet against Getafe, while Tito impressed for Rayo Vallecano in their win at home to Betis. Mesut Ozil set up a goal for Ronaldo and was on form for Madrid on Sunday, as was Athletic’s Ander Herrera, his side’s finest outfield player in the victory over Atletico. Jose Barkero was vital for Levante as they beat Valladolid and Chori Domínguez shone for Rayo as he continues his impressive campaign. In attack, Ronaldo and Messi claimed perfect ratings after hitting three and four goals, respectively, and the two are joined by Rayo’s Piti, who was key in Rayo’s success against Betis.